After reading this great blog post on the Jeans Street in Kojim, Japan, my wife and I decided to make a day trip there. Now, bear in mind that I am no great jean or raw denim enthusiast, but I am definitely easily swayed by fashion trends that involve technical minutiae. That and I have a couple of friends who are in to denim so I figured it would be worth visiting. The above blog post really does a great job of covering the Jeans Street, and if you are at all interested you should go there first. But, I did find a few bits of information that were left out of that post, so I thought I'd be helpful and post some of them here. For a short bit of background, there's some famous Denim brands in Japan, particular famous to those who like 'raw denim.' The city of Okayama, which is otherwise none too notable, is the home more or less of Japanese Denim. But in the small city of Kojima, 20 minutes away by train, a number of these famous Japanese brands have set up a shopping street dedicated to nothing but denim. Like I said, the above blog post does the whole thing much more justice. 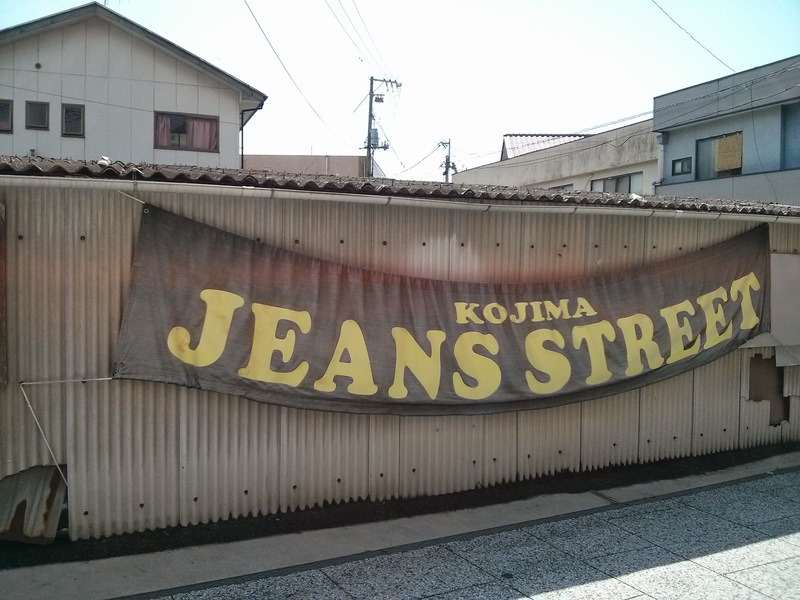 Getting To Kojima: Despite what I gathered from the above article, the Jeans Street is not in Okayama, it's in Kojima which is a separate town about 20 or so minutes away by train. To get there, first you need to get to Okayama, which has a Bullet Train (Shinkansen) station. Then from Okayama station, take the Seto Ohashi Line south towards Kojima. It goes about every 20 minutes and was very easy for us to find. Get off at Kojima Station. Getting From Kojima Station to the Jeans Street: Once you are arrive at Kojima Station, you can get to the Jeans Street by Taxi or by Bus. Location: The Jeans Street is HERE on Google Maps. Taxi: A taxi to the Jeans Street costs about 700 yen, and the drivers will know where to go. Note that it will be very difficult to find a taxi back to the station unless you can call one. Bus: Here is a map and bus schedule that I scanned. The bus costs about 140 yen, and will take you from the station to the place on Google Maps I linked above. When it finished its loop it will take you back from the same spot. Map of Shops: This PDF has a map of all the shops and their names. Description of Shops: This PDF has English descriptions of the stores in the above map. This Google Doc contains the same information, but also with Google's Optical Character recognition enabled, to act as better bait for Google's search engine. Food/Drink: There are plenty of restaurants and cafes, so see the above map of shops for more information. Hope this helps! If you have any other questions I'm happy to try to answer them in the comments.